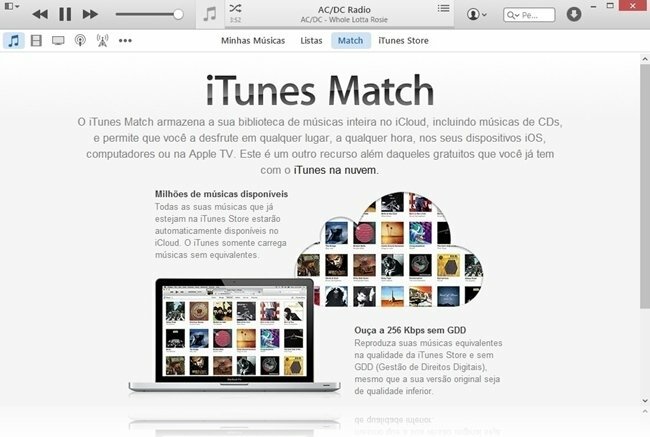 This version of iTunes is not compatible with your operating system, veja a versão compatível. 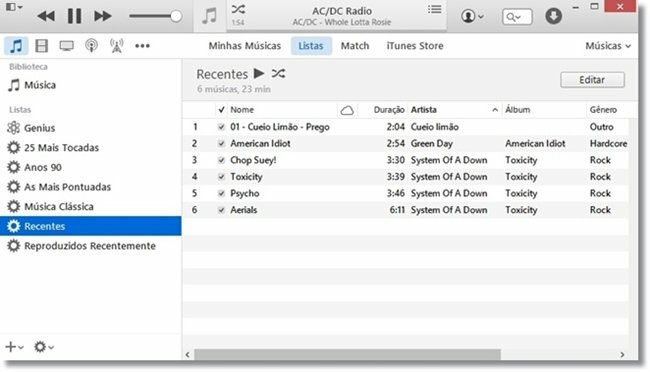 O itunes é perfeito até pra quem não tem produtos Apple. Passo todos os meus CDs pro pc com uma qualidade muito melhor do que dessas musicas que você baixa por aí e ele já organiza tudo sem eu precisar ter trabalho, além de todas as outras coisas que se pode fazer, como baixar podcasts ou até comprar musicas com boa qualidade. 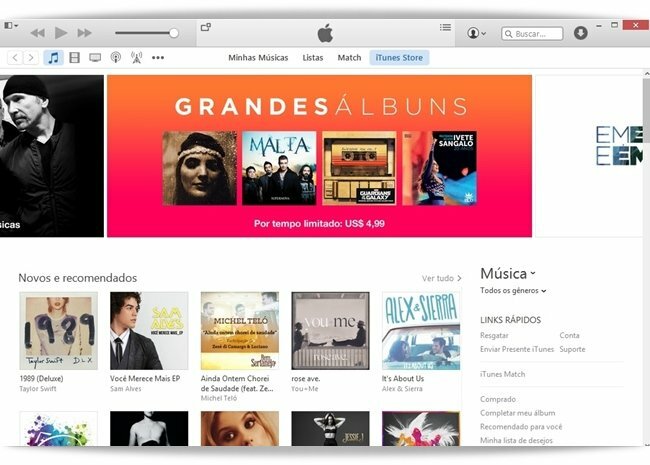 Depois do atentado que fizeram ao design de aplicativos no ios 7, a apple, não satisfeita, resolveu estragar o itunes. eliminaram a barra lateral na versão para windows (esconderam na versão para mac), dificultando a navegação. sumiram com a barra de volume. não é mais possível compartilhar playlists... há algum(ns) maluco(s) lá que está se especializado em irritar clientes. saudades do steve jobs... estão sabotando a empresa que ele criou. o novo ícone do programa já indica o caminho: do azul para o vermelho. iTunes is the multimedia manager of Apple and an indispensable program for who owns some of the portable gadgets of the Apple. It can also be a good tool choice for anyone who wants a multi-purpose and intuitive application to manage and run their audio and video files. In addition to the music and movie collections on your machine, this program offers access to a huge amount of online content, including TV shows, film productions, songs and podcasts - both free and paid. Another great highlight of iTunes is its ability to sync data between computers and Apple devices such as iPhone, iPod and iPad. That way, you can access your files anywhere and anytime you want or need them. The basic function of iTunes is to listen to music, after all it was created just for this. For this purpose, just like any other good audio player, this application offers a series of tools to control reproductions and manage your music collection. As far as song execution is concerned, the program has the traditional mechanisms for pausing, closing and beginning of playback, forward or rewind of a track, volume adjustment and random or cyclic playback. As usual, you can track the runtime and know the title of the song as well as the artist who plays it and the album it was released on. A peculiarity of iTunes is its floating miniature player for the Desktop. This way, you can control the playback of your favorite songs (plus videos or podcasts) with greater comfort and ease, since you do not need to open the full application window. In its smallest form, this miniplayer displays only the basic manipulation buttons of the execution. In turn, regarding the organization of your library, the program allows you to create custom playlists or enjoy the Genius feature, which automatically lists lists of songs based on the songs you listen to. In addition, your repository can be segmented by artist, title, genre, album, year, or rating. Still in the music world, this Apple product offers an extensive and diverse list of online radios, allowing you to get to know new songs or artists and listen to bands of bands and singers that you enjoy but have not yet bought. Among the available genres are rock, hip hop, blues, pop, electronic, classical, country and more. The iTunes AirPlay feature allows you to listen to your songs in any of the rooms in the house. And the best: without the need for cables, as the application becomes compatible with wireless technology. All you have to do is have speakers, receivers or iPod-enabled accessories in your home so your entire library can be accessed from anywhere in your home. Simple and fast. How about watching movies and serials, without interruptions, in high definition and without having to buy them definitively? With iTunes, you get to have a rental company at home. Each download has a fixed cost and is valid for a certain period, which is usually 30 days. Once you run the file and start watching the movie, that deadline drops to 48 hours. That is, you can schedule your purchases and watch when you can. The cool thing is that the rented content can be viewed on any Apple device that operates with this manager. After iCloud, Apple's cloud storage service, was announced, it was only a matter of time before iTunes would integrate with it. 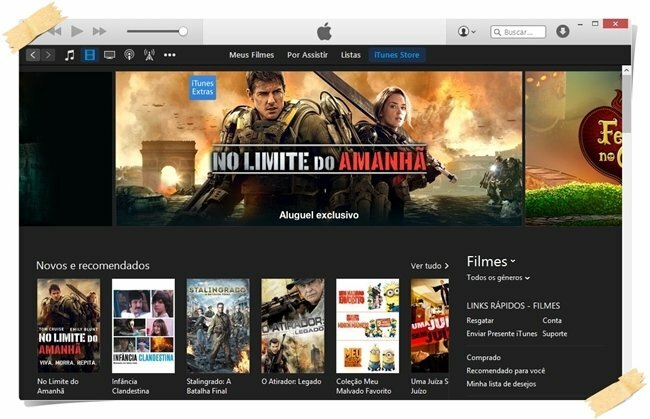 As expected, Maçã's multimedia manager is able to perform file backups and reproduce content purchased from the virtual store directly from the brand's cloud computing engine. To do this, simply log in with your Apple ID and double click to play the file you want. In addition, you can transfer a copy to a mobile device or run it offline. This "partnership" goes further and offers a playback synchronization system, which remembers where you left off in a movie or TV show. Also, whenever you play the same movie or episode on your iPhone, iPad, iPod touch or Apple TV, it will continue exactly from the paused point. And that's not all. ITunes has an advanced search system, in which you simply type a piece of the term you want to search for the program to instantly show the possible results found throughout your library. If no file is found for this search in your collection, the program then displays search suggestions in the store. ITunes has always been praised for its clean, sleek and modern look - in fact, a combination of features that is considered an Apple brand for its products. And the company has spared no effort to make its multimedia manager even more beautiful and practical. In its most recent update, the program has been redesigned in its interface, which did not promote significant changes in its appearance, but can make its interaction even more practical. These changes were basically focused on two parts of the program. The first one consists of the different content sections (Music, Movies, TV Shows, Podcasts, Internet Radios and others), which are no longer collected in a dropdown menu. Now they have gained a placeholder in the top bar, where only their icons are displayed. It is worth mentioning that you can edit which of these shortcuts will be displayed or hidden and gathered in a single button. The other modification is due to the various filters in your library (Title, Artist, Albums, Genres and others) that were previously accessed through the unique buttons in the top bar of iTunes and from the most recent update were merged in the section "My songs". These filtering features still exist, but are now offered through a dropdown menu. Such a concept of "wiping" the menus and shortcuts offered is also applied in the movies section. If anyone doubted that iTunes could improve, recent updates from Apple's multimedia manager proved that it still has a lot to show. Redesigning your interface made the program look even cleaner, sleeker and more modern. Visually, it is difficult to find software as beautiful as this. More than beauty, the interface presents an excellent organization of its menus and tools, promoting an uncomplicated and very intuitive interaction. 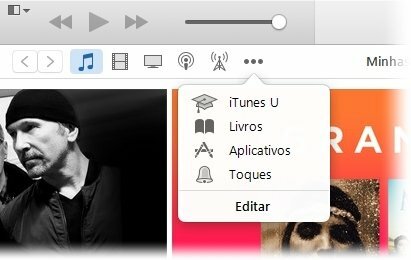 Even if you've never played with an earlier version of iTunes, you should not find it difficult to enjoy your latest edition - which is further facilitated by the fact that it is fully translated into Portuguese. Among the various tools presented by the application, the most notable were the integration with iCloud (allowing the reproduction of content directly from the storage service of Apple), the miniature player and the search system. The quality and combination of these features make your operation very efficient and uncomplicated. Other than that, classic content rental, store and file synchronization services between different devices remain in full operation, making it easy to access your music, movies, podcasts, books, TV shows and other favorite content. ITunes has long been criticized when used on Windows for its high consumption of computer resources, being blamed for constant crashes and slow PC. Apparently, Apple is committed to solving this problem, which has been softened with its latest updates. During our analysis, we could see that the performance of the multimedia manager has improved, requiring less of the hardware components and promoting a transition between bands or videos, for example, much more fluid. For example, while listening to an extensive playlist of songs, the program had a consumption of only 28.3 MB of RAM. However, we should note that we are still experiencing some delay in the initial implementation of the program. The first time it is played on the day seems to require a little more from the computer. However, we did not face any major problems, and this slowness of primary reproduction was not repeated while enjoying music and movies. One of our disappointments, which is actually more related to the iTunes Store than to the manager itself, is the lack of conversion and adaptation of the marketed values from dollar to real. Despite this, it is undeniable that iTunes remains one of the best players and managers of audio and video files in the market.